Why are Politicial Posters so Rubbish? This blog is staunchly apolitical, unfortunately Politics has other ideas. I was planning to write a blog about how awful the photoshop and Image-skills of the Facebook and supposed political party Britain First are. However, with the shooting in France the other day I decided to look at the idea of offence, political imagery and Britain First. It’s an all-to-literal (and all-to-common) generic political-image that any of the three main parties could of produced. I assume the ‘artist’ was hired with the brief “make a poster as bland as humanly possible,” to be fair, they succeed. Yet when I first saw it I pondered “Why are they paving over the Union Jack?” Secondly I pithily (or was it pathetically?) tweeted “Conservatives: Paving over the Cracks” (Have I got News For You, I’m awaiting by the phone). And just so I don’t show any political-bias here’s Ed’ Miliband looking like an Aardman Creation– but less voteable. Britain First, if you haven’t the privilege of a Facebook friend (and while on the subject can we re-name Facebook to Lad-Bible-and-people-you-knew-five-years ago-book?) 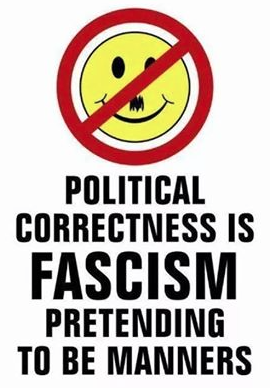 re-posting a Britain First post then frankly dear you, you are in luck. A supposed political Party, Britain First are an offshoot of BNP, run by a portly, thuggish, recently convicted-criminal and all round numbskull Paul Golding. The party would describe themselves as Islamophobic, xenophobic, racist, Misogynistic, Homophobic, Fundamental Christian and Fascist. Except they wouldn’t, because judging by their Facebook Feed they have the collective intelligence of an anaemia. Remember, this blog is apolitical and none of this last paragraph can be debated, except perhaps the last line, you could argue they have less. These aren’t even the worst, just a standard of their tat. Where do begin? Images represent a thousand words and yet all I see is “Yuck.” Political Parties live off of votes, being a Facebook parasite Britain First live off Memes. Both the right and left image shows Churchill who appears prominently in many of their images. 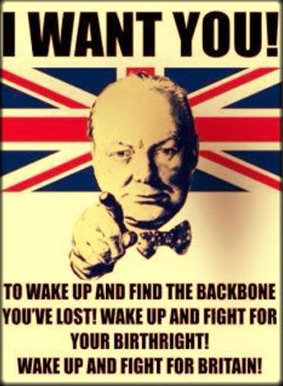 The why is obvious, Churchill has enough charisma and backstory to be shared about (all the three main parties, The BNP and UKIP claim he would support them if he were alive today). The cult-of-churchill is alive and kicking and but we know he’s British, what’s the point of pointing the Union Jack behind him? Also I have a backbone cheers – I’m not prone to liking posters that chastise me. Who am I fighting against? 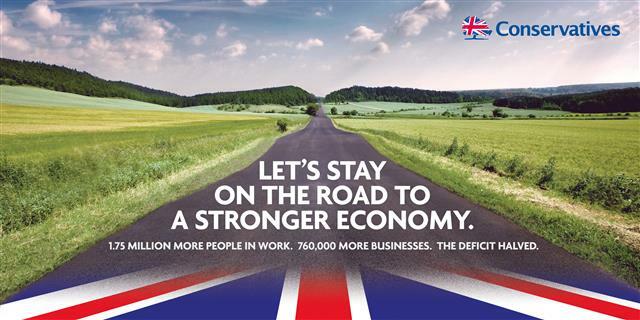 Unlike the Conservative poster with it’s plodding message on economics we are left unsure what this message is. Immigrants I suppose, but thats’ only a guess, it could be Vampires or genetically modified chipmunks. Jumping straight to the third image on the right. 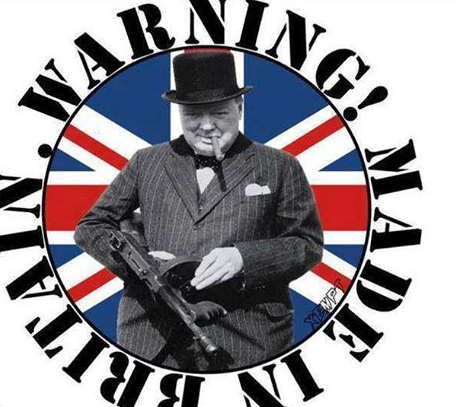 What does Warning: Made in Britain mean? It’ll be more expensive AND more dangerous than China and had it’s heyday in the ’40s? I’m not sure that’s the best way of advertising your countries goods. If I could invent a time machine I would (after many fun shenanigans) show the nobel prizewinning laureate his face planted next to utter crap – I’m not sure he would be that pleased. The middle image is so mind-numbingly tedious I can’t really be bothered to type about it, I know I promised but wants’ the point? Political images should incite me into action. At present all they seem to do is incite me to tedium. The Paris shootings unfortunately showed how stupidity reacts when incited, freedom of speech is far more Important than our petty freedom to be offended. Thus I will not criticise Britain First or any other political Party for being offensive but rather other their poor design skills.